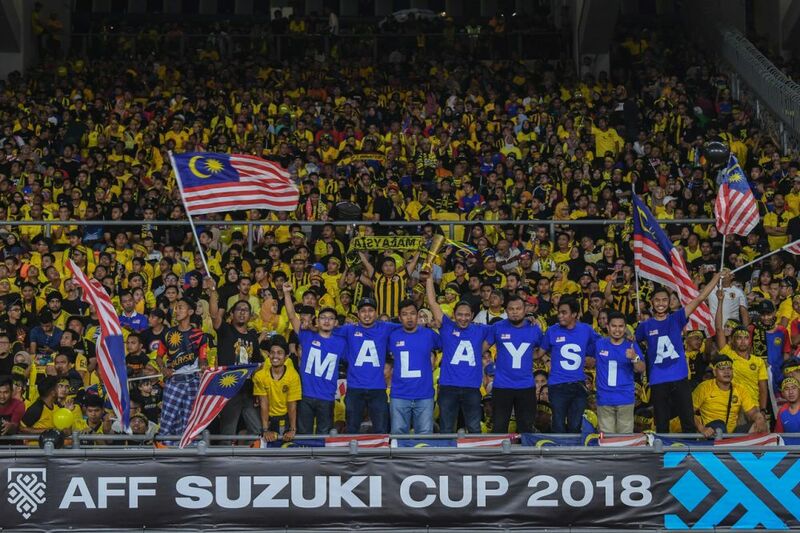 The first leg of the AFF Suzuki Cup finals took place at the Bukit Jalil National Stadium on Tuesday night, with our Harimau Malaya fighting hard for a 2-2 with Vietnam. 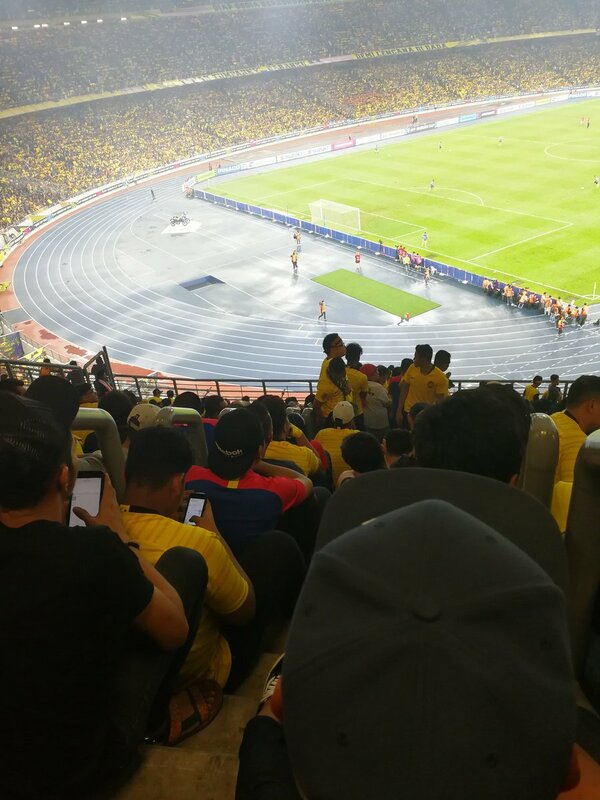 Thousands of Malaysians, from Ultras Malaya to celebrities and even our Prime Minister, attended the sporting event to give their undying support to our national team. The rainy weather definitely didn’t dampen the spirits of those at the stadium (including us), but if there was one thing that affected us, it was definitely the overcrowding situation in the stadium. It is said that the Bukit Jalil National Stadium can house up to 87,411 spectators at one go and since tickets to the match were sold out, it’s safe to say that the number of fans who turned up matched that number. An hour and a half before the match kicked off, the stadium appeared to be overflowing with a steady stream of fans still walking around each level in every aisle in hopes of finding an empty seat. As the match was about to start, those without a seat had no choice but to sit on the stairways. The Rojak Daily team also attended the match and we were also among the unfortunate ones who sat at the stairways despite arriving about three hours before the game. It truly felt like we were canned sardines. 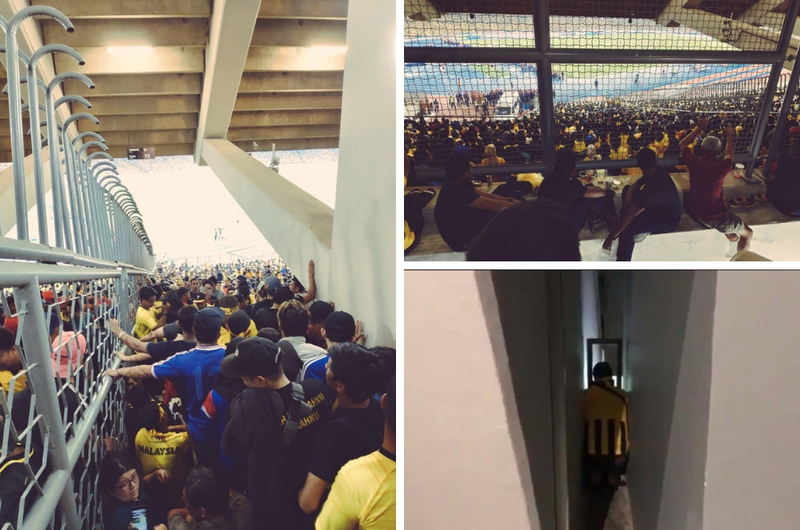 Some desperate fans who did not get a place to sit even placed themselves at hazardous locations such as squeezing themselves in between pillars just to get a glimpse of the match. Looking at the photos and videos shared by fans, it truly felt like 100,000 people occupied the stadium. If the stadium's capacity is just 87,411, where did the extra 13,000 tickets come from? Hmm. Duduk lantai. Plus orang tolak2 belakang badan.. Macam dalam tin sardin.. Tetibe separuh masa kedua.. Ade org lain dtg penuhkan area tu lagi, 😪 over capacity giler..
Bukan kali pertama masalah ni berlaku. Setiap kali game semi dan final Harimau Malaya, byk fans akan berpusu-pusu ke SNBJ. Tak ada system kawalan langsung dan stesyen LRT tak dapat menampung bilangan org yg turun naik kat Bkt Jalil. Safety first FAM! Jgn sampai ada stampede! A Tragedy Waiting to Happen? 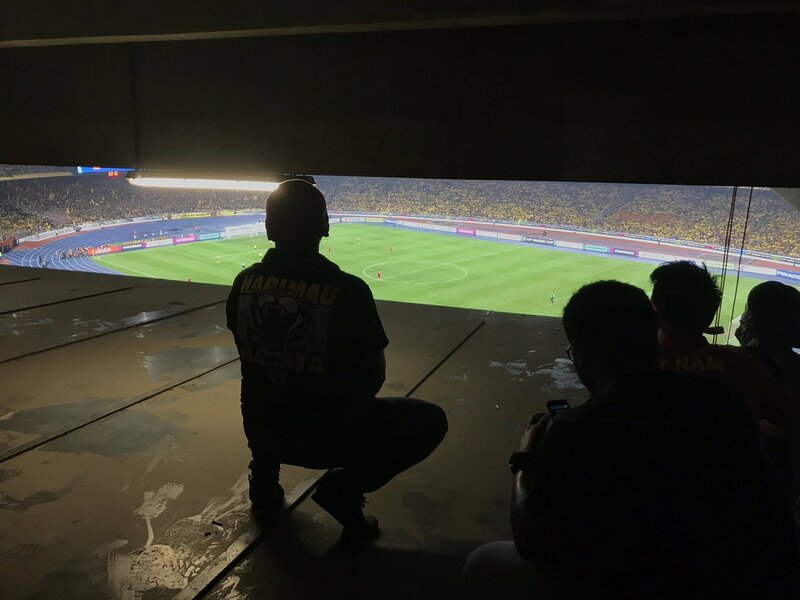 Astro Awani reporter Ian Johan Ariff shared some concerning clips of fans watching the match in the stadium via his Twitter account. 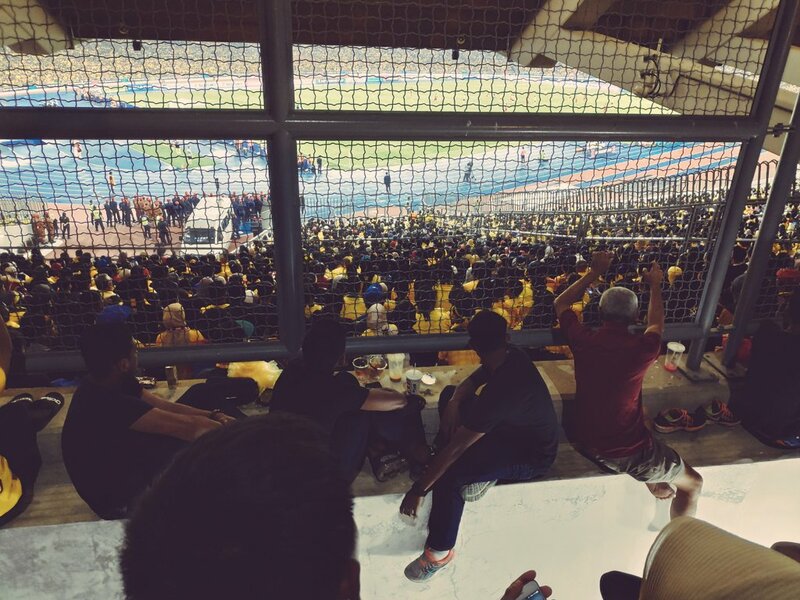 “The Bukit Jalil National Stadium is always crowded every time #HarimauMalaya plays, exceeding the eating capacity. "Spectators put their lives and safety on the line for our national squad but should we turn a deaf ear to these issues? What happened to the safety regulations?” the reporter wrote in his video caption. Based on our observation, all stairways and exit areas were occupied by spectators, so if something bad were to happen in the stadium, getting everyone evacuated will definitely be chaotic and possibly a fatal feat. And after some time, we felt the air getting thinner and we had difficulty breathing as we barely had any room to move. 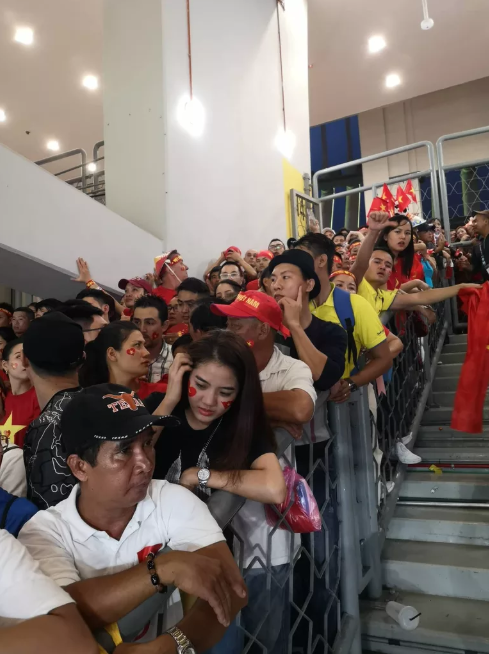 A report by the New Straits Times also pointed out that Vietnamese fans were very disappointed when they found out that there weren’t enough seats. One fan complained to the English daily that he’s not going to stand for 90 minutes to watch the match. No explanation was given to why the tier was off-limits for Vietnamese fans. 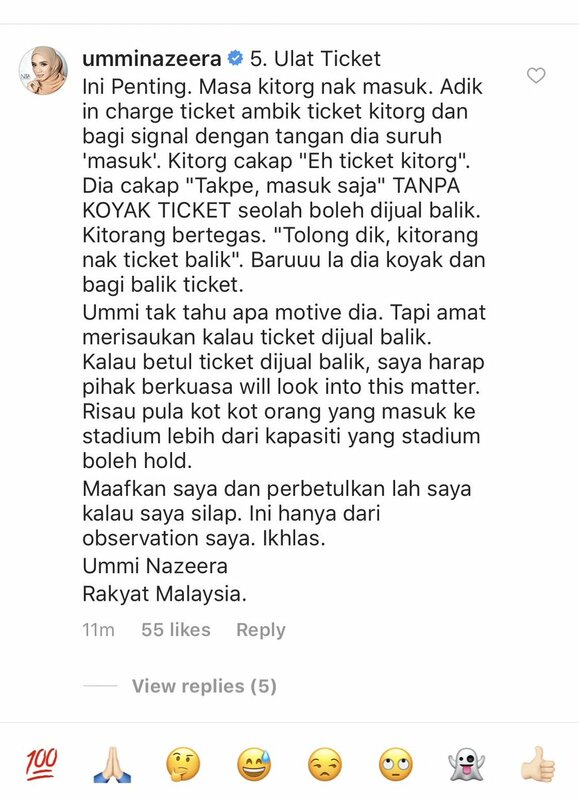 Ticket scalpers are parasites that will always pop-up whenever there’s a high-profile event happening.This time around, the AFF Cup finals weren’t spared. After news broke that tickets were sold out just thirty minutes after they went on sale, scalpers were quick to resell their tickets almost 1,500 times the original price via social media site or market place platforms such as Carousell. You can read about it here. Many spectators have claimed that those who were in charge at the gates took their tickets instead of tearing the stub, raising suspicion that these people were planning to resell the tickets to fans who were lingering at the entrance. There were also alleged reports that all fans had to do to gain entry without a ticket is to pay the gatekeeper an entrance fee of RM50. Received info that some fans just had to pay gatekeepers RM50 last night to get in. On top of that, some fans shared that they were duped by scammers online who told them to meet at the venue to collect their tickets after making payment. According to these fans, they later discovered, at the venue, that the tickets didn’t exist and their ‘ticket’ was an illegal entry. It seems that the government and concerning authorities have a lot of issues to weed out to prevent such event from happening again in the future. We can’t wait for a tragedy to strike before we seriously consider enforcing stricter rules and regulation when it comes to crowd control and ticketing. 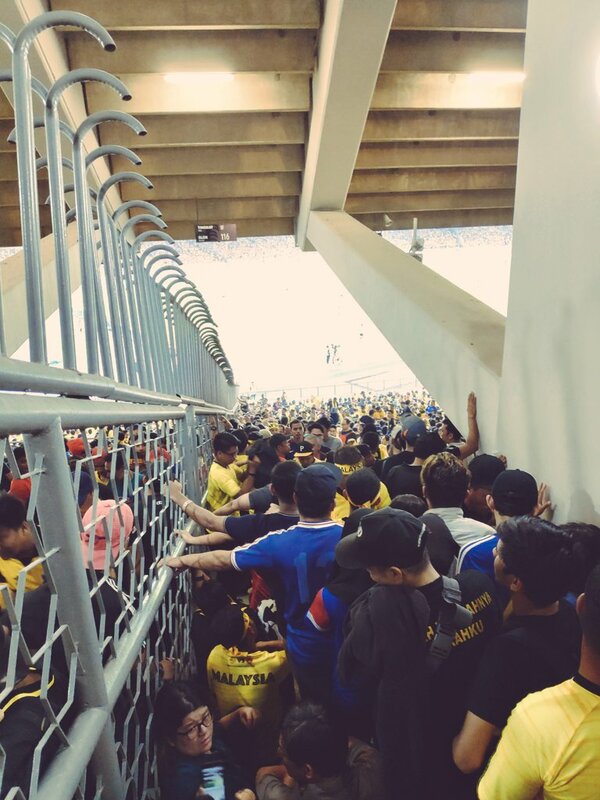 To the Football Association of Malaysia's (FAM) credit, they issued a statement saying that they are currently working with PDRM to investigate the overcrowding issue during the finals. You can read the statement here. Because fans are an important part of sports, we can’t risk running a poorly organised event. Some even take their time and effort to travel from other states just to support our national team, so making their safety a priority is the least that the organisers can do. As the Malay proverb goes, “Sudah terhantuk baru terngadah” (When one is in a disastrous situation then only caution will be taken). A lot of Malaysians agree that the best way to tackle the problem is to introduce numbered tickets with seating details, complete with a QR code to determine the authenticity of the tickets. Another way is to stop supporting ticket scalpers no matter how desperate you are. When there is demand, there is always supply. If people stop buying from them, this opportunitist breed will eventually go extinct. Oh, and on a seperate note, all the best to our Harimau Malaya who will be doing battle in Vietnam this Saturday (15 December); our prayers and support will always be with you. It’s time to bring home the cup, boys!